Tullow Oil PLC (TLW.LN), an oil & gas, exploration and production group, said Tuesday that in Ghana, West Africa, Jubilee Phase 1A production has started and the Okure-1 exploration well has encountered low net to gross oil bearing reservoir in a secondary objective. -In Guyana, South America, Tullow has let its interest in the Georgetown License expire. -Okure-1 exploration well, drilled in the Deepwater Tano license offshore Ghana, has reached its planned total depth of 4,511 meters; well encountered non-reservoir quality formations at the main objective levels below the TEN cluster and discovered a gross 17 meter interval of low net to gross oil bearing Turonian age sandstones within an overlying secondary objective. -Light oil with a 40 degree API was recovered from this interval. -Integration of wireline logs and pressure data indicates that this oil accumulation isn't connected to other hydrocarbon discoveries in the license area. 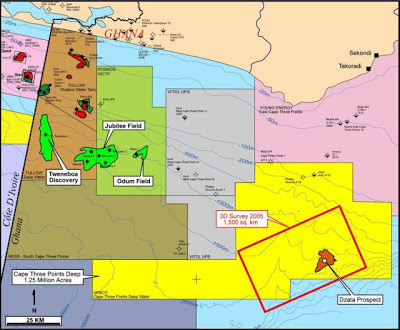 -Next exploration activity to be carried out by the rig will be the drilling of Sapele-1, adjacent to the Jubilee field, also in the Deepwater Tano License and is expected to be spudded by the end of the year. -First Jubilee Phase 1A production well has been brought on stream and is now producing in excess of 16,500 barrels of oil per day, or bopd, resulting in field production of over 90,000 bopd. -This is the first of five Phase 1A producers which are planned to be completed before mid 2013. -Rig is now carrying out acid stimulation work on two Jubilee Phase 1 wells to further enhance production before completing the second Phase 1A production around year-end 2012. -Tullow operates the Deepwater Tano license and the Jubilee Field and is partnered by Kosmos Energy, Anadarko Petroleum, PetroSA and the Ghana National Petroleum Corporation. -Tullow continues to evaluate oil exploration opportunities in Guyana and the wider region. -Shares closed Monday at 1256 pence valuing the company at 11.4 billion pounds.